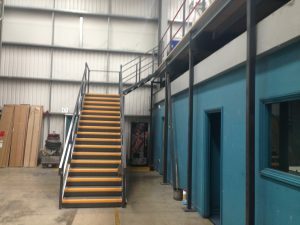 HMF had previously fitted out the plumbing company’s internal warehouse & were chosen again to provide external galvanised pallet racking this time for their yard areas. They needed to provide external storage for their ceramic product ranges and were using a temporary building in their yard and this was replaced with new galvanised pallet racking supplied by HMF. The hot dipped galvanised pallet racking was suitable for external environments and was fitted directly to the existing concrete slab and levelled with levelling plates to accommodate the slope in the concrete yard. 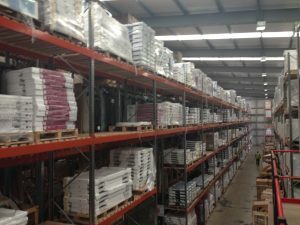 The hot dipped galvanised pallet racking was designed to take 2 tonne per level and was designed to be picked with a counterbalance fork truck. 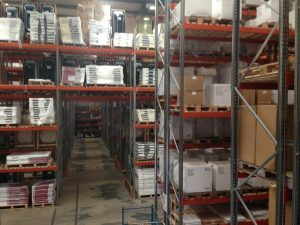 The benefit to the customer is that they can now store these products externally releasing more space within their warehouse for normal warehouse use. The racking was installed within a 2 week period & the project was completed on programme & within budget.